This morning I awoke at twenty to three, as sometimes happens when, unable to keep my eyes open after dinner, I fall asleep before nine. Walking outside onto my porch, I looked up and saw Orion rising in the east. “Hello, my old friend,” I said – imagining my hunting companion returning from his summertime wanderings across the southern sky. Summer is traditionally a quiet time in law offices, including ours, and this restful period before the bustle of early fall is a good time for reflection – and reconnecting with friends and clients. In June Trish and I said goodbye to my Assistant, Anat Myers, who has taken a job in Boston. Anat was with me nearly from the beginning of my independent practice – and has my gratitude for her good cheer and support for three years. This week we send our summer intern, Andrew Emerson, off as well. Andrew, a resident of Amherst, New Hampshire, is returning to The College of the Holy Cross in Worcester, Massachusetts for his senior year and to finish his bachelor’s degree in political science. Good luck Andrew! This month three clients honored me by asking me to serve as trustee of their estate planning trusts. There are three basic options for a trustee whom you designate to serve after you and/or your spouse no longer can: a friend or family member, a professional (for example, a lawyer or accountant), and an institution (bank or trust company). There are pros and cons to each, and the choices must be weighed carefully in light of your particular situation. Please feel free to call the office for a consultation if you have questions about trusts or trustee selection. Katja, my wife of seventeen years, our four children and I have been tending First Light Farm on Abbot Hill in Wilton for seven years now – “forty acres of brush and trouble,” as Greg Brown once put it! No mule – we did have a HUGE Belgian mare but she ate more than she produced. Now we farm by hand and occasionally with a borrowed Kubota. We farm to have a shared enterprise that provides a center of gravity for our family, anchoring us against all of the pulls of office, school, and the kids’ other activities. We farm to give our children meaningful work to do, to draw part of our living from the land in a less harmful way, and to build a place where whoever comes after us can do the same. A couple of weeks ago an investment advisor colleague, Joe O’Keefe of Ameriprise in Bedford, New Hampshire, took me and friends David Baker, Paul Morin, Tricia Newhall-Grahame, and Tricia’s daughter Lexi fishing off the New Hampshire coast. Despite the rain, we had a good outing – Tricia and her 34″ striped bass are pictured below, and in addition to a couple of other nice stripers, we caught thirty or forty mackerel. I brought a dozen of them home, and my friend (and local celebrity chef) Mike Ziele smoked them – the taste was amazing! I have long wanted to fill our freezer and smokehouse with bushels of summer-caught fish, but have been concerned about the sustainability and carbon footprint of going out in a big diesel-powered motorboat. So, this summer we skipped the family trip and instead sent Katja and Elias to the WoodenBoat School in Brooklin, Maine for a week’s course building the smallest, cheapest sailing/rowing vessel we could fit our whole family on for a day’s outing on the lakes or in the sea. 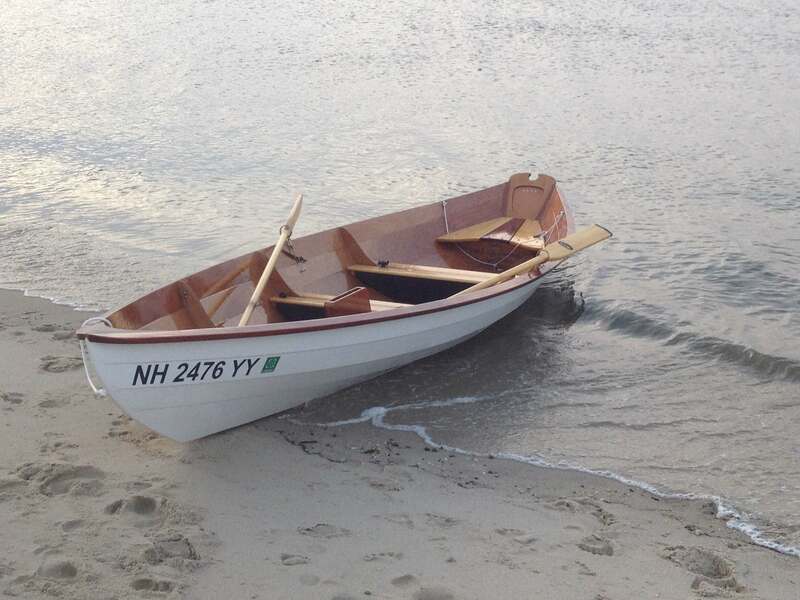 This seventeen-foot stitch-and-glue Northeaster Dory is a kit from Chesapeake Light Craft. We’ll spend the winter finishing it in the garage. Stay tuned next spring for pictures of her maiden voyage! feel moved to do so, and please forward to anyone who might be interested – it helps us spread the word and makes our independent lifestyle a bit more financially sustainable.